I had to inform myself a little about Kansas before commenting. The Kansas experiment may indeed have helped Cruz although Trump always emphasises he intends to keep welfare assistance preferring to slash bureaucracy (will Zootopia turn bureaucracy into slothocracy in common parlance). 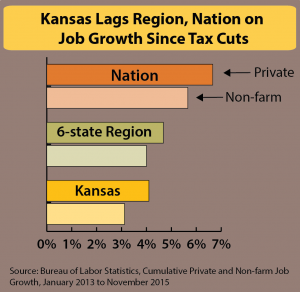 The Kansan Legislators discovered that removing income taxes from the revenue stream leaves a very big hole to fill – a hole which to date consumption taxes have failed to fill. Yes – there’s a lesson there for Federal Republicans – but they’re usually all bluster and in reality big spenders. Modern governments are. The voters demand it. As for Trump, I’m still mesmerised. I suspect if he gained office he’d be more moderate, prepared to negotiate with just enough Trumpism to keep it interesting. And there are few things more dispiriting than contemplating President Hillary Clinton. The Kansas experiment I think holds most interest for the heavy swing against Brownback in his second gubernatorial election. Any attempt to implement any of the tax plans advocated by Republican candidates would require big deficits or big cuts to spending. Hitting vulnerable people yet again to provide tax cuts to the wealthy is likely to benefit bigoted demagogues or the Democrats. In either case the Republican ‘establishment’ will be further diminished. Perhaps not, though barring a severe misstep on the part of the Clinton machine, it’s virtually assured that she will win. Even with her royal pedigree, President Hillary is a markedly more agreeable state of affairs to any Republican candidate. Although I find some of Bernie’s ideas less than practical, if his success in the primaries is able to drag the Democratic Party a little leftwards, then so much better. I haven’t yet seen evidence yet that Trump is dragging the Republican Party towards anything other than ruin. The republican establishment are right to fear Mr Trump because at core the the GOP is now just a bunch of spruikers for their paymasters on Wall Street. It is hard to know exactly what Mr Trump will do as he has been very vague on policies but considering the enthusiasm of some for likening him to a certain populist with a penchant for natty tailoring it is a surprise that they have not started to look at the economic policies of that period. If Trump is serious about making the USA great again – breaking the headlock and wealth extraction practices of Wall Street must be his first objective. The fact that he has told Wall Street he doesn’t want their money suggests they are in his sights. Much the same as what Bernie Sanders may have in mind but Trump probably has the force of personality to make it happen. And as history tells us – it is not always the nice guys that win the prize. Hillary is as much in the vice of Wall Street as any Presidential candidate in recent times. To hear her now parroting Sanders’ anti Wall Street Big Banks Will Fail Jail the Banksters spiel is sickening. GOP is in crisis; so too the Democrats as Sanders’ unprecedented appeal has demonstrated. He has forced Clinton to the left and this exposes her hyprocrisy along with that of similar parties where self preservation and financial connection Trump ideology. Every time. GOPs problems (aside from its lunatic religious element) lie in its rhetorical subscription to economic conservatism in a world where government welfare dependency is de rigueur – embedded in the economic framework and not easily excised. The Republicans need a reinvigorated platform that pays attention to fiscal conservatism, acknowledges the role of welfare, tones down the God stuff and, as Trump has captured so well, assures those that have not been on the winning side of the economic downturn, that Republicans care and will act in their best interest: welfare in need and transition to jobs and growth as the economy prospers. Trump’s been great for GOP. As has Sanders for the Democrats. I suspect that’s overly optimistic, I can’t see Trump having that level of monetary nuance. Indeed I don’t think he’d do much at all except lurch around with a wrecking ball, growing increasingly antagonistic towards his once-great nation. But I have to confess to a certain morbid curiosity to find out exactly what a Trump presidency would look like! Not a lot of monetary nuance is required it just depends on whether Donald buys all the neo-liberal hocus pocus or actually does understand what being a nationalist is all about – economically speaking. Its not complicated just not very well understood anymore. If Trump simply acts like a boorish dictator he presents no threat to anything other than liberal sensibilities. If he organises the economy like a real American nationalist (there haven’t been many) then it will get interesting. His choice for his Treasury team will be something to watch. Trump doesn’t need to be operating the machine. He just needs to get the public approval for his team to run the machine. How might they run the machine? The book the Princes of the Yen provides a pretty clear idea of how to run an economy in the national interest. Is there anyone you have in mind who’s likely to run a nationalistic monetary policy, and who’s likely to be chosen by Trump? In any case, it’s very hard to see him winning sufficient public approval at the national level. White anger doesn’t have the same potency in general elections as in Republican primaries. Moreover, the Republican machine will do a lot of the grunt work for Hillary before the main event even begins. No – I don’t have anyone in mind but they would be coming from well right or left of the contemporary centre. It is a big country and I am sure there would be a few lying around somewhere. I think calling the Trump phenomena “white anger” is too simplistic. I agree if that is all he offers if he wins the nomination then he will may lose because he will do an excellent job of “getting out” the minority vote. Having watched about three of the republican debates from start to finish (uurgh) it is not difficult to see how he is leading the republican race. The sound bite coverage on the news and “commentator” analysis is misleading. He is much more wily and smart in his performances than ‘liberals’ and ‘conservatives’ are prepared to give him credit for. It would not surprise me in the least that Trump will head straight for the centre (i.e. right of centre) and “make nice” if he wins the nomination and then a whole bunch of people who have been reading the “horror stories” will think “hey he is not that bad and I have been lied to”. Do you think Trump is going to care that those that nominate him feel a bit like he has gone soft and a bit New York? He knows their choice at that stage is going to between him and Hilary. Trump’s “success” is only a little bit more surprising than Abbott who was also derided as a buffoon, thug, misogynist, clown etc etc etc. A rational dispassionate observer having watched Abbott in office might be justified in asking how on earth did he ever become PM. The same thing could happen in the US. It is not as though making Hilary president seems to be capturing the imagination of the democrats. Oh I have great respect for his political abilities; he is a consummate demagogue, leading the race for a reason. But that doesn’t change the fact that his supporter base is overwhelmingly white. His message resonates so well with middle and lower class white voters because that’s the demographic to which cries of former greatness hold meaning. For minorities, especially blacks, harking back to lost glory days is just plain offensive. So certainly, as you say, he’ll need to adjust his message and broaden his appeal should he achieve the nomination. I feel as though there are already signs of attempts being made in that regard. Hillary and Trump will be a surreal showdown, all the more fascinating should Trump shoot for the centre. I still expect his style to be proven a great advantage in the primaries and a big hindrance in the general, but the risk of finding out that I was wrong is going to make for a nerve-racking campaign. Just re-read our exchange earlier this year. Interesting in light of what came to pass. My expectation that Donald would head towards the centre proved wide of the mark. Though every so often there was a sniff he would start hitting the target and nail the core issue driving an unbalanced international economic order. Probably right for him to keep on keeping on with his free wheeling narrative of ‘rage’, though one wonders how tomorrow would be looking if he was not so over the top. But then anything is possible so who knows it might be President Donald 24 hours from now. If Hillary does win I hope she takes both houses so we dont get another 8 years of Republican obstruction and toy throwing. They only have themselves to blame. Wholeheartedly agree. Whatever Hillary’s weaknesses as an agent for change, her platform is sensibly liberal at a time when extreme inequality demands a leftward lean. It’s unconscionable that Republicans would be given the opportunity to slash taxes in the current climate. Trump is personally odious, but his economic policies are largely in tune with Republican consensus, and the lasting damage of that actually worries me more. I can’t get too excited about the House, but the Senate is a decent shot. 24 hours later and Donald is the Prez to be. I guess going over the top wasn’t such a problem after all. If he is serious about doing what it takes it could be a very interesting period ahead. The key will be whether he is prepared to unplug or at least wind down the dollar recycling model that has driven off shoring and formed the basis of the World Police model. A more aloof USA has a range of benefits and potential costs. I suspect interest rates internationally are on the way up in the near future. Yes we’ll see. I doubt he has that much nuance and I suspect he’ll surround himself with garden variety conservative advisers. The magnitude will be interesting to see, but big tax cuts coming for Big Business and the very wealthy (token crumbs coming for the middle class). Near-term inflationary certainly, especially if public infrastructure spending is a feature. Long-term it’ll be extremely hard to claw back lost taxes; from memory corporate rates have only been hiked once since WWII. The masses have voted to reject to globalism and in doing so they’ve handed its chief beneficiaries a huge payday.